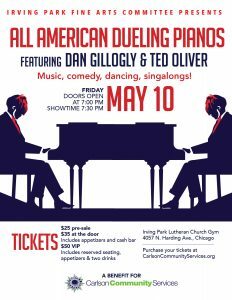 Carlson Community Services is thrilled to present All American Dueling Pianos on Friday, May 10th at 7:00 p.m. Dan Gillogly, local legend and pianist extraordinaire will match wits and trade tunes with the equally talented Ted Oliver. You can expect a rousing evening of comedy, sing-alongs, dancing and all-around amazing entertainment. Dan is a resident of the Irving Park neighborhood with over 30 years of experience as an entertainer. 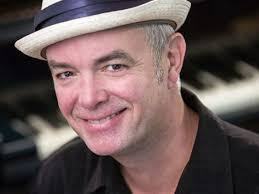 He is a former music director at Second City and has performed at Howl at the Moon, The Redhead Piano Bar and on stages across the world. Tickets for the show are $25 in advance and $35 at the door for general admission, which includes light appetizers and a cash bar. VIP tickets are $50 and include premium reserved seating, appetizers and two drinks. The event is a fundraiser for neighborhood non-profit Carlson Community Services and will be held at Irving Park Lutheran Church gym, 4057 N. Harding Ave. Carlson operates three programs – an after-school program, community garden and classical music concert series. Its mission is to connect the Irving Park community with programs that enrich lives through education, culture and service. Why travel downtown or to the suburbs to see the best dueling pianos show? Here’s your chance to see Dan perform right here in the neighborhood, for a great cause! For more information, contact Liz Mills at lizmills@carlsoncommunityservices.org. To get a taste of what to expect, visit Dan’s web site. All American Dueling Pianos — where you can sing like no one can hear you and dance like no one can see!